It's Hamiltime! – Dedicated to preserving the legacy of America's most underappreciated, influential, and handsome Founding Father. Albany Law School will confer an honorary degree on Alexander Hamilton in recognition of his influence in the Albany area. The degree will be conferred as part of the law school’s 167th Commencement ceremony on May 17, 2018. The award will be accepted by Douglas Hamilton, Alexander’s fifth great-grandson. Alexander Hamilton was an immigrant, the nation’s first Secretary of the Treasury, author of a large portion of the Federalist Papers, and a Colonel to George Washington in the Revolutionary War. 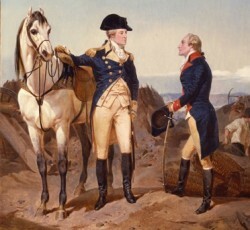 Hamilton traveled to Albany for the first time in 1777 on behalf of George Washington to meet with General Horatio Gates, to convince Gates to provide Washington with reinforcements. In 1780, Hamilton married Elizabeth Schuyler at the Schuyler Mansion in Albany where Aaron Burr was one of the invited guests. Elizabeth was the daughter of the prominent Albany family patriarch Philip Schuyler, a Revolutionary War general, and Catherine Van Rensselaer Schuyler. Hamilton spent considerable time in Albany, staying often with his in-laws when legal work brought him to the state’s high courts. Both Hamilton and Aaron Burr studied law and were admitted to the bar by 1783. They both opened law offices in New York City. Because New York’s Capitol, the highest court—the Supreme Court of Judicature (later the Court of Appeals)—and the state legislature were all in Albany, Hamilton and Burr were frequently in the area. Burr kept an office at 24 South Pearl Street, while Hamilton often stayed with his in-laws the Schuylers. Continuous conflicts between Burr and Hamilton eventually led to Burr challenging Hamilton to a duel in 1804. It was the Albany Register that published a letter with disparaging remarks allegedly made by Hamilton about Burr that brought the conflict to a head. Reportedly Hamilton shot in the air, but Burr aimed and hit his target. Hamilton died the following day at age 47. On July 4, 1786, Alexander Hamilton gave an oration to the memory of Nathanael Greene in front of an audience of fellow Revolutionary veterans in the Society of the Cincinnati. Greene had died unexpectedly of heatstroke on June 19, 1786 at his home in Georgia. Hamilton noted the strong connection that he felt to Greene because of their shared service to their country. All the motives capable of interesting an ingenuous and feeling mind conspire to prompt me to its execution. To commemorate the talents virtues and exploits of great and good men is at all times a pleasing task to those, who know how to esteem them. But when such men to the title of superior merit join that of having been the defenders and guardians of our country—when they have been connected with us as companions in the same dangers, sufferings, misfortunes and triumphs—when they have been allied to us in the still more endearing character of friends—we recal the ideas of their worth with sensations, that affect us yet more nearly, and feel an involuntary propensity to consider their fame as our own. We seem to appropriate to ourselves the good they have acquired, and to share in the very praise we bestow. Hamilton spoke of the potential of revolution to provide opportunities for people to display their talents and virtues. It is an observation as just as it is common that in those great revolutions which occasionally convulse society human nature never fails to be brought forward in its brighest as well as in its blackest colors: And it has very properly been ranked not among the least of the advantages which compensate for the evils they produce, that they serve to bring to light talents and virtues which might otherwise have languished in obscurity or only shot forth a few scattered and wandering rays. Although he was speaking about Greene, Hamilton could have been talking about his own dreams of glory in revolution. He noted that Greene would have been destined for a more ordinary life if it had not been for the “violated rights of his country” calling “him to act a part on a more splendid and more ample theatre.” Given this opportunity, Green did not hesitate to take action and risk everything. Happily for America he hesitated not to obey the call. The vigor of his genius corresponding with the importance of the prize to be contended for, overcame the natural moderation of his temper; and though not hurried on by enthusiasm, but animated by an enlightened sense of the value of free government, he chearfully resolved to stake his fortune his hopes his life and his honor upon an enterprise of the danger of which he knew the whole magnitude in a cause which was worthy of the toils and of the blood of heroes. Hamilton proceeded to give a long, but riveting (and slightly embellished) account of Greene’s military accomplishments and his instrumental role in battles in South Carolina and Georgia. The evacuation of the two capitals of South Carolina and Georgia intirely restored those states to their own governments and laws. They now hailed the Illustrious Greene as their defender and deliverer. Their gratitude was proportioned to the extent of the benefits resulting from his services nor did it shew itself in words only but was manifested by acts that did honor to their generosity. But where alas is now this consumate General, this brave soldier, this discerning statesman, this steady patriot, this virtuous citizen, this amiable man? Why could not so many talents, so many virtues, so many bright and useful qualities shield him from a premature grave? Why was he not longer spared to a country which he so dearly loved, which he was so well able to serve, which still seems so much to stand in need of his services? Why was he only allowed to assist in laying the foundation and not permitted to aid in rearing the superstructure of American greatness? A contemporary description of the event called it an “elegant eulogium” and noted that the President, Vice-President, senate, the speaker, and the house of representatives all attended. (Note that because this was before the Washington Administration, the President and Vice-President at this time were elected under the Articles of Confederation). Laurens challenged Lee to a duel shortly after writing to Hamilton. The duel took place on Christmas Eve, December 24, 1778. Hamilton was Laurens’ second in the duel, and Lee’s former aid, Major Evan Edwards, served as Lee’s second. 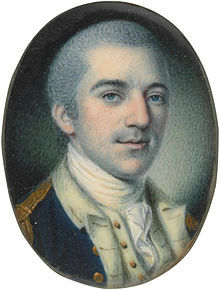 (Interestingly, Edwards named his son Charles Lee Edwards, after the general). Hamilton wrote an account of the duel, available on Founders Online. According to Hamilton, Laurens fired and hit Lee and then Laurens, Hamilton, and Edwards all came towards Lee to check on his injury. Lee then stated that his wound was “inconsiderable” and tried to insist on a second round, which Hamilton, Laurens, and Edwards vigorously opposed. Hamilton told Lee that unless Lee was “influenced by motives of personal enmity,” he should let the duel terminate. Lee still insisted on continuing the duel, but then decided to let both of the seconds- Hamilton and Edwards- negotiate a peace. They approached each other within about five or six paces and exchanged a shot almost at the same moment. As Col Laurens was preparing for a second discharge, General Lee declared himself wounded. Col Laurens, as if apprehending the wound to be more serious than it proved advanced towards the general to offer his support. The same was done by Col Hamilton and Major Edwards under a similar apprehension. General Lee then said the wound was inconsiderable, less than he had imagined at the first stroke of the Ball, and proposed to fire a second time. This was warmly opposed both by Col Hamilton and Major Edwards, who declared it to be their opinion, that the affair should terminate as it then stood. But General Lee repeated his desire, that there should be a second discharge and Col Laurens agreed to the proposal. Col Hamilton observed, that unless the General was influenced by motives of personal enmity, he did not think the affair ought to be persued any further; but as General Lee seemed to persist in desiring it, he was too tender of his friend’s honor to persist in opposing it. The combat was then going to be renewed; but Major Edwards again declaring his opinion, that the affair ought to end where it was, General Lee then expressed his confidence in the honor of the Gentlemen concerned as seconds, and said he should be willing to comply with whatever they should cooly and deliberately determine. Col. Laurens consented to the same. Hamilton and Edwards discussed the issue, and then Lee and Laurens talked about what resulted in the duel in the first place. Lauren stated that he had been informed “that General Lee had spoken of General Washington in the grossest and most opprobrious terms of personal abuse.” Lee stated that he had given a negative opinion of Washington’s “military character,” but had not attacked Washington’s personal character. During the interview a conversation to the following purport past between General Lee and Col Laurens—On Col Hamilton’s intimating the idea of personal enmity, as beforementioned, General Lee declared he had none, and had only met Col. Laurens to defend his own honor—that Mr. Laurens best knew whether there was any on his part. Col Laurens replied, that General Lee was acquainted with the motives, that had brought him there, which were that he had been informed from what he thought good authority, that General Lee had spoken of General Washington in the grossest and most opprobrious terms of personal abuse, which He Col Laurens thought himself bound to resent, as well on account of the relation he bore to General Washington as from motives of personal friendship, and respect for his character. General Lee acknowleged that he had given his opinion against General Washingtons military character to his particular friends and might perhaps do it again. He said every man had a right to give his sentiments freely of military characters, and that he did not think himself personally accountable to Col Laurens for what he had done in that respect. But said he never had spoken of General Washington in the terms mentioned, which he could not have done; as well because he had always esteemed General Washington as a man, as because such abuse would be incompatible with the character, he would ever wish to sustain as a Gentleman.